Tesaro is having a good day. The biopharmaceutical company reported Wednesday that its drug, niraparib, improved the progression-free survival (meaning that the cancer did not get worse) in people with ovarian cancer in a 500-person phase 3 trial. 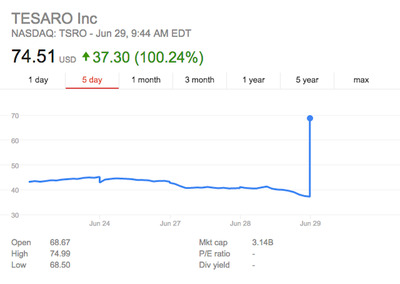 The stock was up 100% Wednesday morning. Niraparib is a pill that’s taken once a day, and it’s part of a new kind of cancer drugs called PARP inhibitors. Essentially, they block a particular enzyme that’s used by our cells to repair DNA. In certain kinds of cancer that repair system is broken allowing cancer cells to thrive, so blocking it is critical. The drugs seem to work particularly well in people with the BRCA gene mutations, which disable other DNA repair mechanisms. For patients with these mutations, the median overall survival went up to 21 months, compared to the control group of 5.5 months. But, Tesaro found, the drug worked not just in people with these mutations, but also in patients who didn’t have the BRCA mutations but had other DNA repair problems (12.9 months, compared to 3.8 months for the control), as well as people who just didn’t have the BRCA mutation (9.3 months, compared to the 3.9 months for the control). 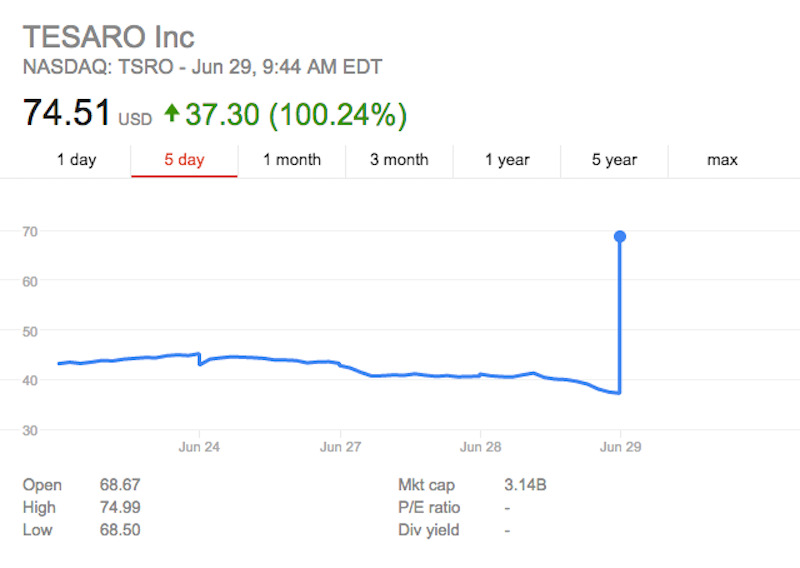 Forbes reports that Tesaro plans to file for approval in the fourth quarter of 2016.